Join the Ethical Toy Program and Save the Children for our webinar exploring how the Children’s Rights and Business Principles (CRBP) are relevant for the toy and entertainment industry. Children are a third of the global population and key stakeholders of the toy industry; not just as dependents of parents working in the supply chain but also as consumers. 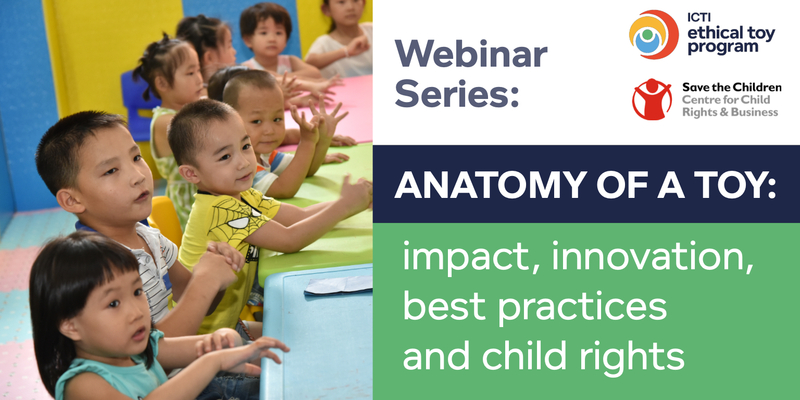 Through a series of webinars, Save the Children and the Ethical Toy Program will explore some of the aspects of how children are impacted through the life cycle of a toy – and update toy companies on the opportunities and actions they can take to respect and support children’s rights. In the first webinar of the series, Save the Children's Centre for Child Rights and Business together with the Centre for Child Rights and Corporate Social Responsibility (CCR CSR), and Ethical Toy Program will introduce and present how the Children’s Rights and Business Principles (CRBP) are relevant for the toy and entertainment industry including examples of practical actions in China.